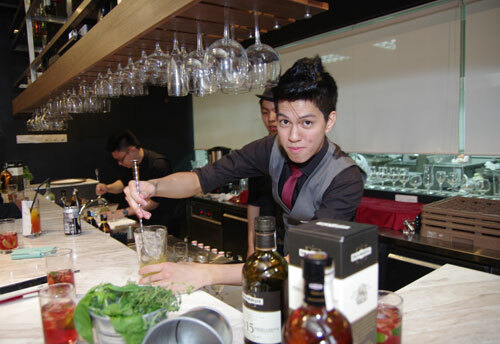 Consistently proving themselves to be enthusiastic learners and keen performers, students of INTI’s School of Hospitality were selected to form the first batch of trainees for Fluid Alchemy’s Quintessential, a platform providing free training and workshops led by professional mixologist and top beverage consultant Ben Ng. Kicking off Quintessential was Black Velvet, a project to plan and execute a gourmet and tapas reception. With minimal supervision from lecturers and staff of the School of Hospitality and under Ng’s keen observation, final year Diploma in Hotel Management students were given free rein to create their own menu courses and beverage selection. They had to apply the skills and knowledge they acquired during the course of their studies to produce scrumptious canapés and cocktail beverages and were graded on their performance in the project which falls under the programme’s Event Management module. Black Velvet allowed students to apply their skills and knowledge to create scrumptious canapés and cocktail beverages. “Quintessential allows us to contribute to the training and development of the hospitality workforce by providing students with a better understanding of the industry. We want to educate students on the reality of the industry, which may be quite different from what is portrayed on reality TV shows,” said Ng who heads Fluid Alchemy, an academy that trains and molds bar staff and operators for the beverage industry. “Practical training is especially important for hospitality students as it creates industry-ready graduates. INTI’s efforts in bringing industry to the classroom resonates with our innovation pillar which offers students experiential learning opportunities pertinent to their academic and professional development,” said Gobinath Selvanayagam, a lecturer from the School of Hospitality who was proud of the students’ efforts. Representatives of project sponsors MONIN and Red Bull were also pleased with the students’ creative endeavors in elevating the flavors of their products through a variety of cocktail mixes that were a hit with the guests at the event. In the first year of the DHM course, students are exposed to the operational aspects of hotel management in areas such as information systems, culinary operations, F&B management and beverage studies. In Year 2, students are groomed to develop managerial and leadership skills and to become independent. They will also undergo internship which gives experience in real-life work environments. Graduates of the course can use their education and training to establish their own businesses ranging from restaurants and bars to hotel consultancy and recruitment companies. They also have the opportunity to pursue degree studies at BMIHMS in Australia. For further information on INTI’s Hospitality programmes, please call 03-5623 2800.